We are going to pretend for a moment that in some alternate reality, it's actually Tuesday and not, in fact, Wednesday. Cool? Cool. I think it goes without saying by now that I'm the Queen of Procrastinationland. I had every intention of getting these baked up yesterday. Um...yeah. Didn't work out so well for me. 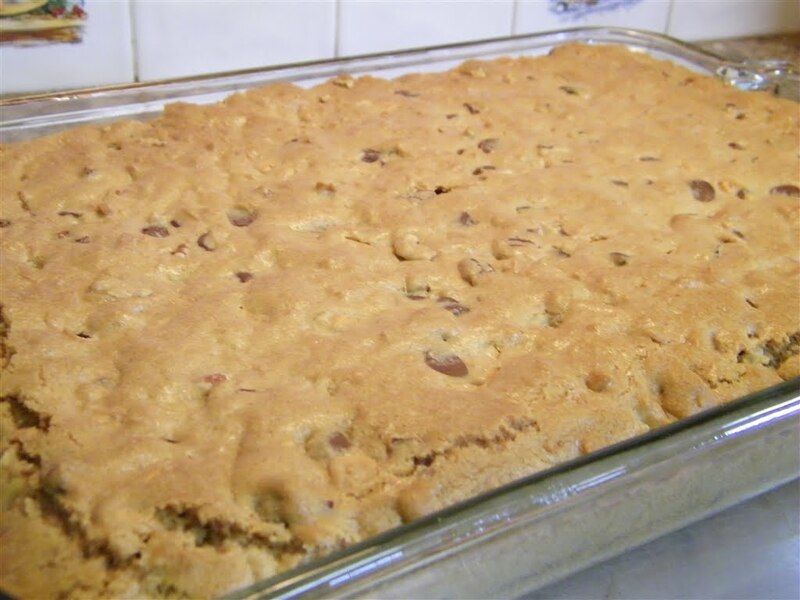 Anyway, this week's Tuesdays with Dorie selection was for Chewy, Chunky, Blondies chosen by Nicole of Cookies on Friday, and it was a perfect choice for me. See, we live outside of the city limits and whenever we need our land mowed (and I'm using the term "mow" loosely here...it takes a full size tractor) our neighbor has to do it for us. 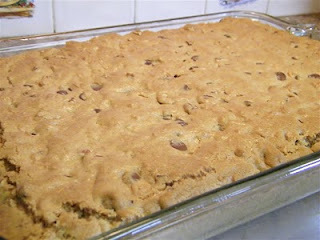 When we first moved out here, I asked him what I could bake for him, and his response was butterscotch blondies. To be honest, I've never strayed from the recipe on the back of the butterscotch chip bag...until now. And I may never go back! The flavors in this bar cookie are just wonderful. In addition to butterscotch chips, Dorie calls for the addition of semisweet chocolate chips, walnuts and coconut. Well, okay, I used pecans. I'm from Texas. What do you expect? 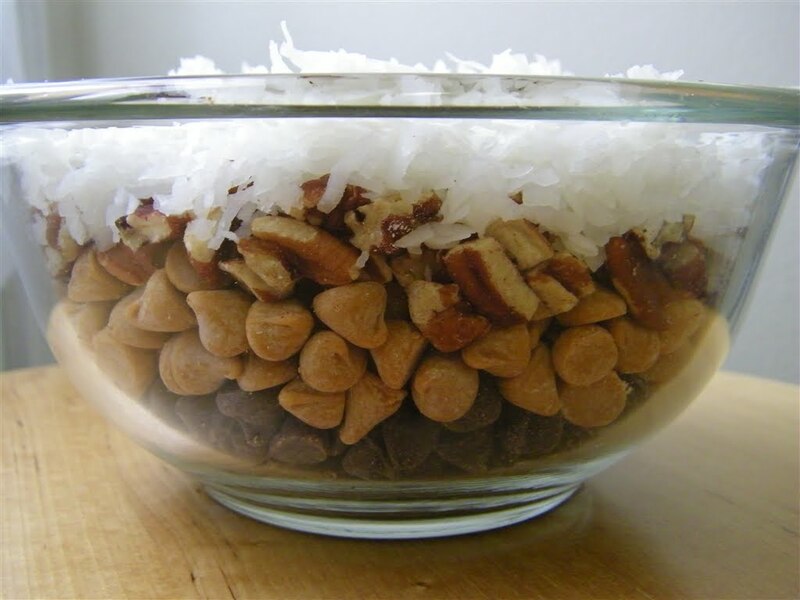 You can also vary up the flavors a bit, using toffee bits instead of the butterscotch chips, and I'm sure there are other ways you could change it up too. These are actually still cooling as I type. However, I couldn't stand it and dug a corner out to try. They are definitely tasty. I foresee this recipe becoming a permanent fixture at my house! To view the recipe, check out Nicole's post. And be sure to check out what the other TWD Bakers did with this weeks' selection! You had better have tried at least a corner of these babies!! These are so awesome. 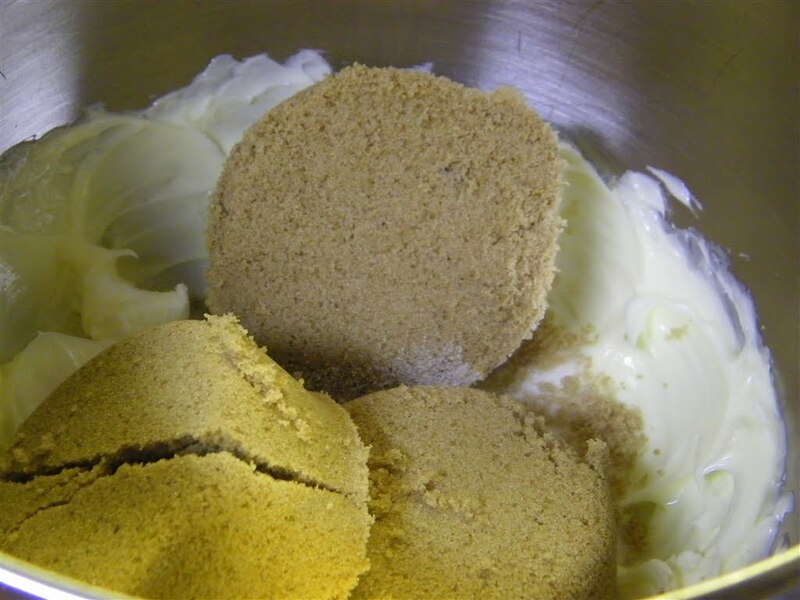 But if you'll be baking them again, you'll soon find that out. They look wonderful and I'm sure your neighbor enjoyed them. Better late than never! ;) These really are great. Love that photo at the top with the bowl of goodies. These blondies are pretty hard to resist! Yours look perfect. By now you have tasted and learned that they are wonderfully delicious. They look perfect. "Mowing" with a tractor ain't mowing. It's a job for days and days. 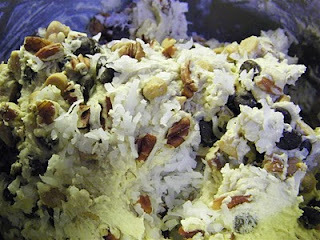 I used pecans too, since I don't like walnuts. Yours look really good and make sure you try them. Thanks for baking with me this week! Did you share some with your mower person? :) These were awesome, without a doubt!